Release centres of Gharshana (old)! The movie is loosely based on Mahesh Bhatt’s “Janam”! The film was released in fancy theatres in most of the centres. Niroshaa could not sustain her stardom despite getting consecutive hits like Police Dairy (Kamal), Sindhoora Puvvu & Naari Naari Naduma Murari. Amala’s gymanstic skills were used well in the song ” Roojaaloo Letha Vennalleee”! Though Prabhu get’s a more powerful role, it was Karthik’s role which struck a chord with Urban Youth. But I was totally in awe of Prabhu’s body language after I watched it again. The scene where he gets down from his Police Jeep to arrest Karthik is pure celluloid magic as powerful acting blends perfectly with superb technical values —Ilayaraja’s Re-recording Score, P.C. Sriram’s Photography & Maniratnam’s Narration! In fact, I was so impressed with his acting that I went and watched his immediate dubbed release “Police Tiger” on the first morning show at Kanaka Mahal, Nellore. I got to know from my cousin (the producer’s son) that G. Umapathy , who played the villain role, was asked to retain his real life mannerism dialogue “Raajaa” as his stock dialogue. Noon show wonders of 80s — Premalookam! “Premalokam” is one of the very few dubbed versions of a Kannada films that did very well in mid 80s. Since i like icons of pop-culture, I also started following the careers of Kannada stars like Ravichandran, who was fondly called the “Subhash Ghai of Karnataka” for his lavishly made movies on his home banner Eswari Films. “Navatharam Mundhuku Saagaali” and “Saatileeni Preemalookam Manadhee Kaavaali” are two of my favourite songs from the film . In fact, had the first song been part of a high budget straight film, it would have attained a cult status because of lines like ” Jeevitham Oka Paatagaa, Yavvanam Mana Baatagaa”. Juhi Chawla became very popular in Kannada and my cousin’s car-driver in Bangalore used to go gaga over her when I was studying there. But Juhi also joined the bandwagon of Bollywood imports of mid 80s — Mandakini, Kushboo, Sonam and Farha- who failed to make it to the top league in Telugu despite working in successful films like “Kaliyuga Karnudu”, “Mugguru Kodukulu”, ” Vicky Daada”. Noon show wonders of 80s — 100va Rooju! 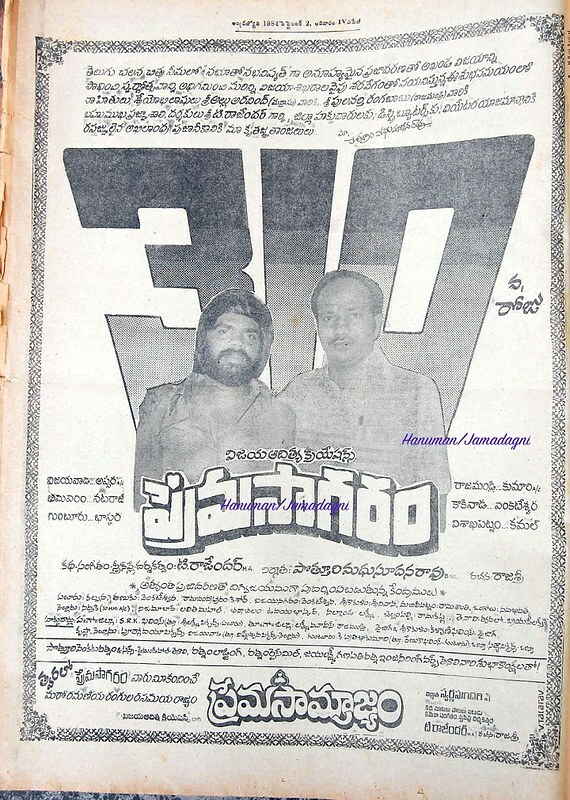 ” 100a Rooju” is one of the dubbed films that did amazing business in 80s inspite of getting only noon show screenings in most of the centres. “Captain” Vijaykanth acted as a CBI officer in this thriller, which has Mohan and Nalini in the lead roles. But it was Sathyaraj, with his tonsured head and Red Jacket, who stole the show. Manivannan, who later directed few straight Telugu films like “Darjaa Dongaa”, succeeded in maintaining the tempo through out the film. Atluri Tulasi Daas, who presented the movie, produced few mass films like “Bezawaada Bebbuli”, “ParasuRamudu”, “Rowdy” before and after this movie. 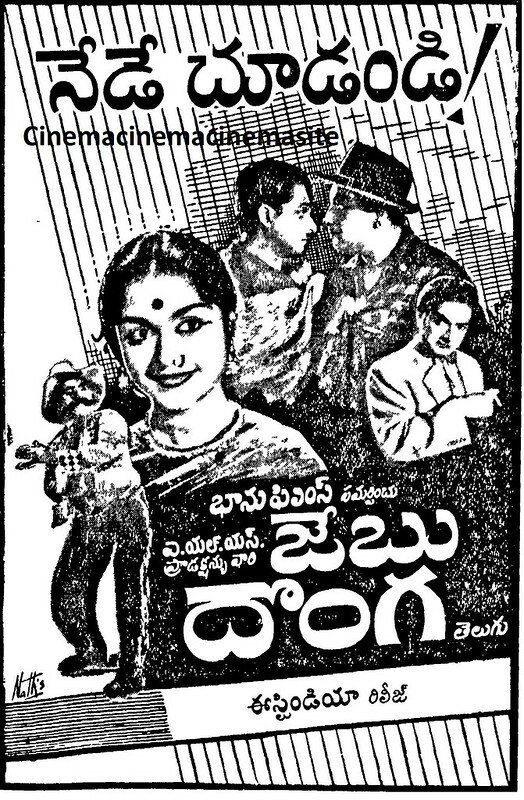 The second image has the film’s 28 days revenues at Manga Deluxe, Guntur. Shortest time taken to reuse a title in TFI! In Sep 1972, a Tamil film featuring Nagesh was dubbed into Telugu and released as “Raaja” to profit from his found popularity in Telugu post Server Sundaram. Maruthi Productions used the title for their second film in the combination of Sobhan & Raghavendra Rao approximately after 4.3 years of the dubbed films’ initial release. I guess this is the shortest time taken by a production house to reuse a title in TFI. The scan below has the first batch release centres of the dubbed film. “Bandipootu Viplava Simham” release centres! Same title in three consecutive decades! “Aaaradhana” and “Jeebu Donga” are two titles that come to mind where they were used for movies at least once in a decade. “Jebu Donga” was first used in 1961 for the dubbed version of M.G.R.’s “Thirudaadhee“. Another title which was used in three consecutive decades is Maanavudu Daanavudu–Sobhan (in 70s), Mohan Babu (in 80s) and Superstar (in 90s). “Chinnari Cheetana“, dubbed version of Malayalam’s “My Dear Kutti Chetan“-the first ever 3D film in India- was a loss making venture for some of its distributors. Several film-makers eventually dropped their plans to make movies using this Technology. Records that impressed me a lot VII! Kathir’s “Hrudhayam” in 90s and T.Rajendar’s “Premasaagaram” had one thing in common. Both were released in noon shows in most of the centres and both succeeded in wooing the teens to the theatres. 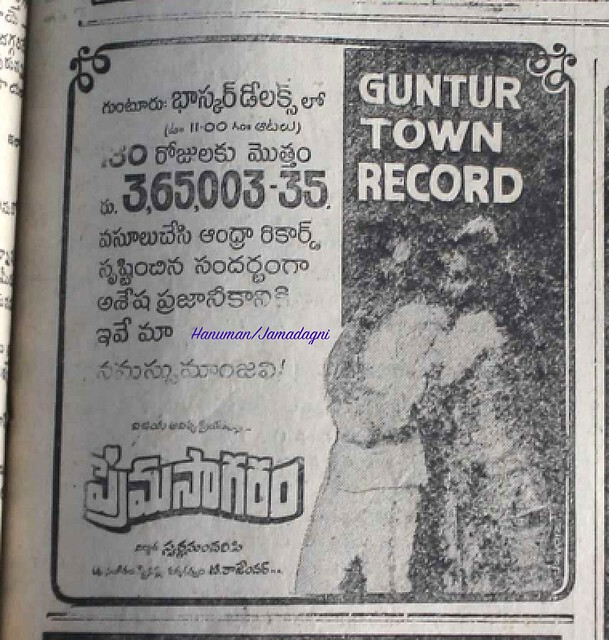 The latter did phenomenally business everywhere more so in Guntur, where the film collected more than 3.6 lakhs. The dubbed film also had a dream run in other centres (scan 2).